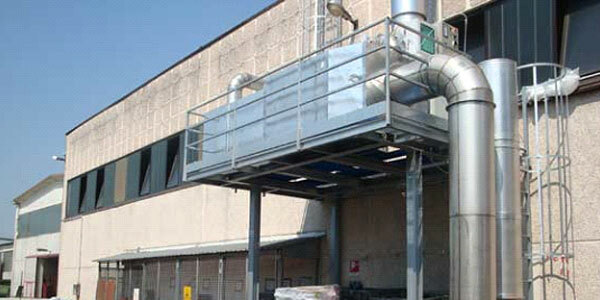 The available solutions ,generally proposed to treat industrial air emission polluted with solvents, generate important annual costs, due to the needed energy (thermal oxidation), the spare parts and service ( thermal oxidation), or replacement of primary material (active carbon filter), or are delicate to maintain and cover a limited range of pollution (biofilters), making them often more expensive than other solutions. TECHMAS is able, if needed, to propose such solutions (see section 4: “More traditional system of treatment). After having analyzed the market, we are convinced that, on behalf of really exceptional situations, there are other much more efficient methods available, allowing a really great energy saving. Two different solution proposed: direct treatment for heavier concentrations, or indirect for lighter pollutions ( absorption on active carbon filters, automatic regeneration of the filters when saturated). The systems proposed are covering the needs of many industries, which are dealing with a mixing of solvents difficult to separate, or too soluble to be separated without “pressure swing”. And when the methods or means used to separate solvent or water are more expensive than the recovered product… you have to find new ways offering substantial energy savings! Used generally for organic solvents, the method proposed is oxidizing them at only +- 250° to 350°C when other thermal solutions have to climb up to 850°C to avoid dioxin. The catalytic oxidation deliver also, while neutralizing solvents, an exothermic reaction, providing calories that will be used to lower in an astonishing way production costs. An auto-thermal situation is already present from 0.65 gr. of concentration, and this until more than 10 gr. if needed, while other thermal technologies start only from 2 to 2,5 gr. The system does not release Nox nor CO and does not have any flame. It takes very little place, is built out of stainless steel and according to the ATEX directives .It follows without problem the flow and concentration variations. Depending on the possible reuse of calories by the customer, the system proposed will give more energy back or will be cheaper with rendering less calories. The catalytic oxidation is delivered on skid, is easily movable, is nearly completely built in stainless steel and can be easily adapted to other flow characteristics, creating a really high residual value. By contrast with cryogeny, the solvent is not recovered in liquid form: the manufacturer has replaced solvent recovery by very significant heat recovery. And what is meant by “minimum operating costs”? Incinerators classics have not provided the solution, because very complicated to operate, repair (technicians), adjust (technicians), move if necessary, and expensive to use because quite often out of auto-thermy. Also repairs and replacement of ceramic beds cost a fortune and generally they do not tolerate chlorinated compounds. 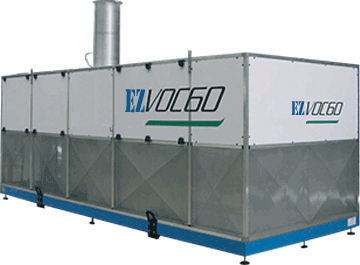 The constructor has developed a system, the EZVOC, which already offers auto-thermal process at very low concentrations of pollutants and ensures an efficient removal of pollutants, including concentrations exceeding 10 g/Nm³. This system, which produces no emissions of CO and NOx, provides constant heat, which allows not only to heat the premises in a conventional manner, but, as the temperature available, allows you to use this energy directly to heat production machinery (flexographic, gravure or other), so as to avoid important gas or electricity consumption. All our systems have been subjected to risk analysis and are built in accordance with the guidelines of the ATEX directive. The very efficient abatement can respond and meet the most stringent standards on emission limits, remaining far below them. At the acquisition cost of the plant, cost levels are below the most efficient systems on the market (for a similar volume of effluent treated). In terms of system operating costs: very low, because the system is self-sufficient in almost all its operations. The energy required to increase the temperature at the start-up is very reasonable (as we only have to reach 150 to 200°C). So the energy needed is just for a few minutes. When our system has to be stopped (because no emission is sent, for example), electro-pneumatic valves are automatically closed: this allow to keep the good temperature inside the chamberfor 2-3 hours without problem. Plant life: particularly long, because of the low mechanical stress of working parts and because thermal stresses are very lower than other conventional heating systems.